Osteopathy is a philosophy of health. It acknowledges that in good health the body should be able to automatically adapt to different demands, and maintain itself in a state of balance. The body is always doing its best to maintain this state of balance, and can recover from or adapt to many traumatic events. However its resources for coping are not endless, and sometimes events occur that are too much for the body to correct without assistance. This is where osteopathy can help. An osteopath is like the body’s mechanic. We endeavour to discover what is preventing the body from its natural healing response and then remove that restriction to aid optimal function. Osteopaths treat the whole person, not just the area of symptoms. This is because the cause of the problem often has its origin in another part of the body. 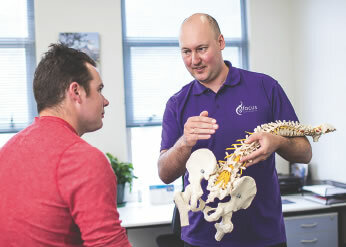 Osteopaths are continually searching to understand and treat the underlying cause of a particular problem. Osteopathy aims to positively affect the body’s nervous, circulatory and lymphatic systems; removing obstructions that hinder the flow of blood, lymph and nerve impulses. This allows the increased movement of nutrients, oxygen and the body’s natural antibodies, which assist the body to heal itself. Patients often report an improvement in general well being, energy levels, sleep patterns and also in areas of symptoms other than those which initially brought them for treatment. Or you can ring directly on 472-3595 and leave a message or you can email info@focusosteo.co.nz. If we are with a patient we are often unable to take your call, however we respond to messages left as soon as we are available. Our goal is to help your body get back to looking after itself by helping it find its own balance again. The number of treatments required is specific to the individual needs of the patient. On your first visit we will be able to give you an estimated timeframe. Where there is no history of significant damage related to the problem and when the complaint is not a long-standing one, most patients will normally experience significant relief within three or four sessions – some in even fewer. Those with chronic issues or significant wear and tear may find they need more regular maintenance visits. ACC provides coverage for personal injuries that have been sustained due to an action or activity. Some medical insurance policies do cover osteopathic treatment. It is best to check with your insurance company directly. Doctors referrals are not required, however some doctors may recommend you see an osteopath. If you have an ACC claim please bring these details with you. Although treatment can be performed over clothing, during the initial assessment it is useful to see the spine, therefore loose fitting clothes, preferably not jeans or tight pants are recommended. Shorts and a singlet to change into are useful. Payment is due at the time of treatment/consultation. If we have to render an account a further charge will be made. We accept cash, cheque and eftpos. Sorry, no credit cards.